Summertime is Florida scallop season! People from all over love to hear those words, when fun in the water and the season's best eats arrive just in time to beat the mid-summer Florida heat. On a recent July afternoon, we had the chance to venture out for some scalloping in Homosassa, just south of Crystal River, on central Florida’s west coast. You may know Crystal River as the place where you can swim with manatees as they retreat into the warm natural springs around the area to avoid hypothermia over the cold winter. But in the summertime when the water temperature is warm and the manatees stay further out toward the Gulf of Mexico, it's the scallops that you can find more easily along Florida's nature coast. It’s the perfect time for a leisurely Gulf Coast road trip like the one we did last year to enjoy all the laid back goodness and yummy seafood in this part of Florida. Slow travel at its best! So we headed out 3 miles into the Gulf to try our hand at snatching up these tasty shellfish. The weather was cloudy but the thunder storms and lightning kept their distance allowing us to slip into the warm water and snorkel around for a few hours. Within minutes, we’d found our first scallops! In 1994, scalloping season was closed for several years along Florida’s west coast in an effort to restore scallop populations. Over-harvesting and poor water quality had led to the crash of commercial scalloping as once-thriving fisheries became barren. 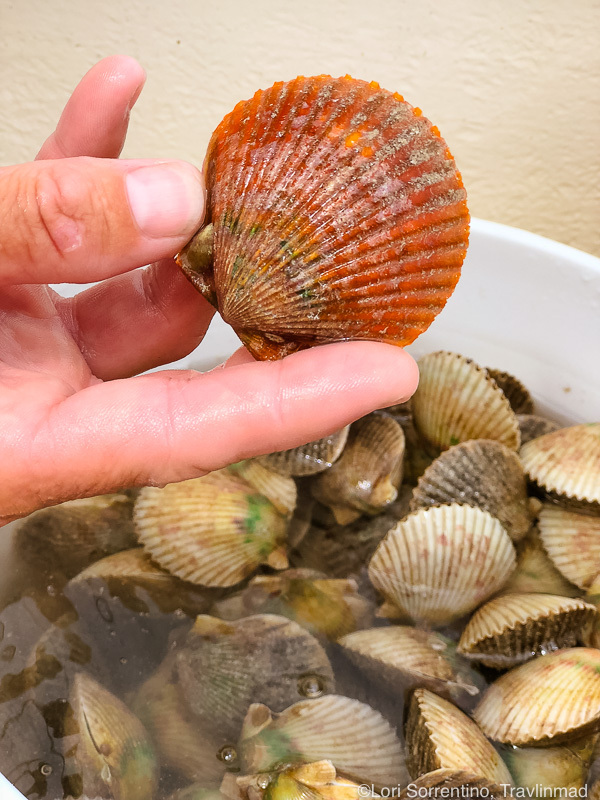 Scalloping in Florida had led to a declining scallop population which became so extensive that the Florida Fish and Wildlife Conservation Commission (FWC) closed the state to all commercial fishing for bay scallops and restricted recreational harvest as well. But thanks to conservation and restoration efforts, areas along the west coast that were once closed were reopened in 2002 for recreational harvesting, to the delight of locals and tourists alike. Today, along the central west coast, scallop season runs from late June/early July to mid to late September. What Are Florida Bay Scallops? Scallops are a species of saltwater clam that live in sea grass beds and often in sandy areas close to grass beds. They are filter feeders, and an adult scallop can filter the algae and organic matter from over 15 quarts of water in an hour. That’s pumping a lot of water for such a small creature! Florida bay scallops are smaller than your typical scallop, and live in 4 to 8 feet of water. They can be difficult to spot depending on the light, water clarity, and how much algae has grown on their upper shell. Along the rims of their shells are rows of tiny blue eyes that detect movement and they can escape a threat by opening and closing their two shells and squirting out water to move along in any direction. They aren’t very fast and they don’t go very far, but it’s enough to thwart danger. Homosassa Springs is known for its natural beauty and wildlife, and it's also one of the best scalloping spots in Florida. If you have a boat, you can certainly go out and scallop on your own if you're familiar with the laws for harvesting scallops. But if not, we recommend taking a scallop tour with a reputable charter operator like River Safaris and Gulf Charters, one of the popular Homosassa scalloping charters (they also operate as RiverVentures out of Crystal River). 2 Gallon Daily Limit - The daily limit of scallops is two gallons of whole scallops per person, meaning in the shell. That's roughly one pint of bay scallop meat if you decide to shuck them out on the water. No matter the number of people onboard the boat, there can be no more than 10 gallons of whole scallops or 1/2 gallon of scallop meat aboard the boat at any time. Use a Dive Flag - If you’re snorkeling from a boat, or even if you’re wading in shallow water for scallops, a dive flag of correct size must be displayed. This is a huge safety issue given the number of power boats that can be moving in a given area. Gather by hand - Scallops can only be harvested by hand, or if you don’t want to get an occasional harmless pinch, you can use a landing or dip net. This is intended to prevent over harvesting and protects the ecosystem as well by not destroying vital grass beds. We had a great afternoon scalloping with Captain Phil, who took care of everything for us during our 4 hours of scalloping! He kept us comfortable and provided a lot of helpful information about the ecosystem. He also put us on what we came for - scallops. River Safaris provided all the minimal equipment you need to scallop - a mask, snorkel, and fins. While fins aren't necessary, they certainly help you cover more area and have extra power for when the water moves with the tides, which can be very strong. They also provided the only other “essential” - a mesh bag with a drawstring top to put your catch in while you scout around for the next one. Make sure to draw the string tight and the scallop drops down in your bag or they might swim back out of the bag. We also wore rash guards on top to prevent overexposure from the sun, important if you want to scallop the next day. Most charters will furnish the equipment, but if you’re fussy about fit you may want to use your own gear. During this time of year, the Gulf water is quite warm, usually in the low to mid 80s. It’s comfortable and you can stay in the water for long periods without getting cold. If you’re concerned about how fit you might be or how strong a swimmer you are, there’s good news. The Gulf is very salty which makes you pretty buoyant. If the tides pick up and become too strong, stay closer to your boat, and tell your Captain if you’re concerned. Just relax and have fun, and make the most of your day in the water. When you spot a scallop, take a deep breath and dive down to get you eye-to-eye and then just grab the scallop. It’s usually only a 5-6 foot dive to reach them. This is also where fins help out getting you to the bottom quickly. You’ll be amazed at how quickly your buoyancy will bring you back to the surface, like a bobber. If you have the time and the desire, you can shuck - or clean - your own catch. Not much equipment is needed. Get an inexpensive special scallop knife - even a teaspoon will work - and a glove with rubber grips used to clean fish - which helps you hold firmly onto the scallop shell. If you'd rather not shuck them yourself, hire one of the many shuckers waiting along the docks or on their boats at the entrance to marinas. These local folks work quick and we found the pricing to be quite reasonable. They can shuck 2 gallons of scallops in about 15-20 minutes. The guy we hired for $10 returned to us perfectly clean scallop meat in a Ziploc bag. You’ll be putting a couple of bucks into the local economy, and it gives you time to go and have a cold beer while you wait. NOTE: Always make sure your scallops are schucked first, if you plan on taking them to a Cook Your Catch restaurant! There are many ways to enjoy your fresh catch -scallops can be baked, deep fried, sautéed, or stir-fried to name a few ways - but why not let a local Chef decide! One of the coolest things to do in Homosassa and Crystal River is to take your day's catch to a local "Cook Your Catch" restaurants in town. 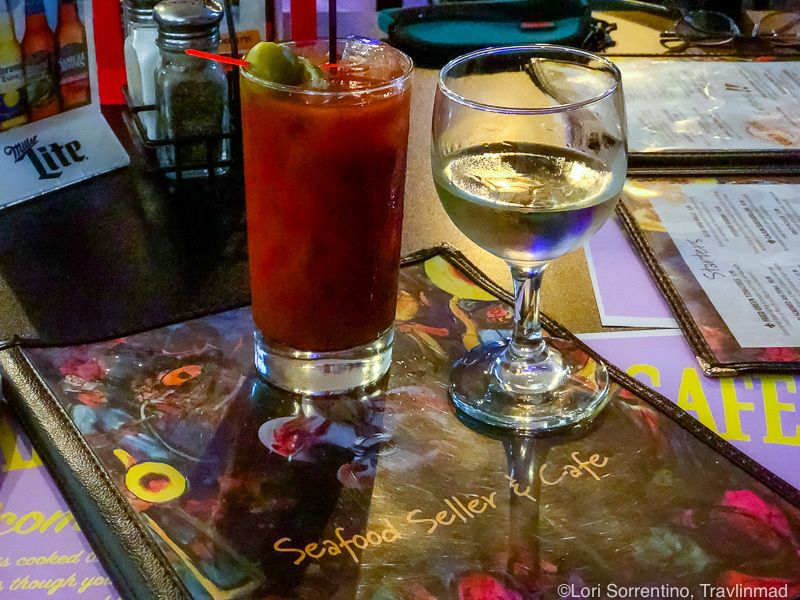 We were so excited to try out the Seafood Seller & Cafe just minutes from our B&B in Crystal River. Their Chefs will prepare your catch to your liking or you can let them surprise you with one of their own creations. We love culinary surprises so we opted to have the Chef prepare something from his bag of tricks. He prepared them in two ways: half were blackened and a bit spicy, and the other half were sauteed in butter, white wine and garlic. Both were simply prepared, perfectly cooked and absolutely delicious! We were so pleased with the Seafood Seller and Cafe, and would highly recommend eating there the next time you're in Crystal River. It’s the fresh seafood that we think makes the Nature Coast one of the most unique food destinations in America! Scallops are healthy for you! Not only are scallops sweet and tender, and they're low in fat and high in protein. All that aside, they are excellent to eat and can be prepared in a variety of way to suit your taste. Whatever your choice on how to enjoy this delicate sea-to-table delight, spending a few hours on the water with friends or family will create an experience to be remembered forever. 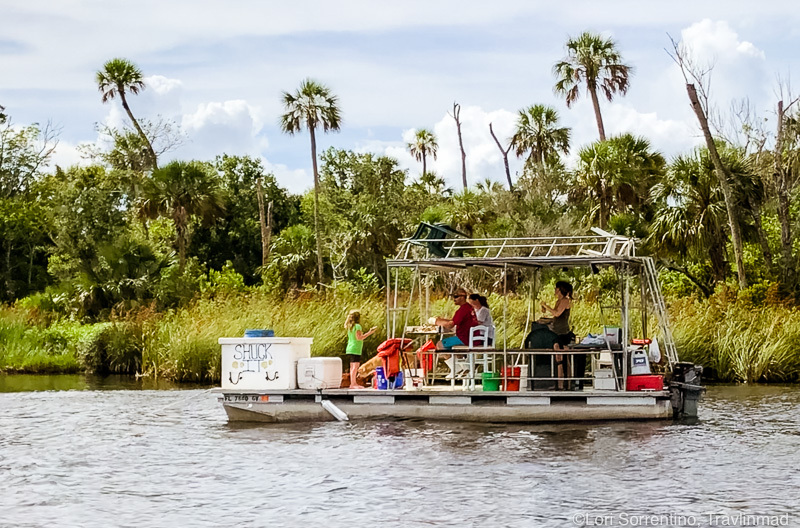 We were guests of Discover Crystal River on our scalloping trip, and as always, all opinions are our own from our firsthand experience.